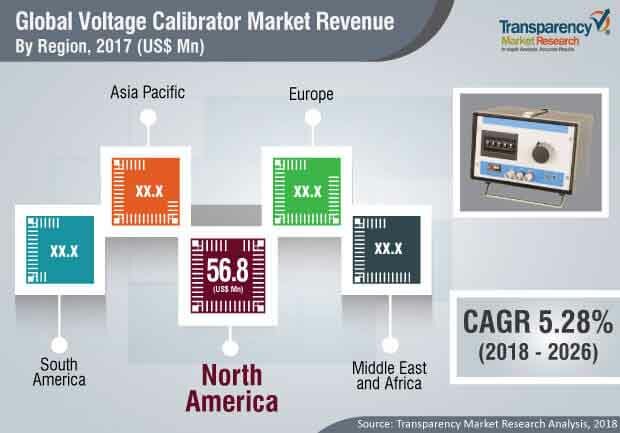 The global voltage calibrator market was valued at US$ 161.28 Mn in 2016 and is projected to register compound annual growth rate (CAGR) of over 5.28 % from 2018 to 2026, according to a new report published by Transparency Market Research (TMR) titled “Voltage Calibrator Market – Global Industry Analysis, Size, Share, Growth, Trends, and Forecast, 2018–2026.” The report suggests that rising importance of electronic calibration, presence of calibration traceability, and increasing significance of process control in semiconductor manufacturing is likely to spur the demand for voltage calibrators in the coming years (2018 to 2026). As key players introduce new voltage calibrators in developed markets such as North America, Europe, and Asia Pacific, these regions are likely to account for leading share of the global voltage calibrator market. Growing production of more efficient and powerful electronic chips in less time by large number of semiconductor manufacturers to deal with the continuously rising competition in emerging markets such as China, Japan, and India is likely to boost growth of the Asia Pacific voltage calibrator market at a growth rate of around 6% from 2018 to 2026. A voltage calibrator reads and sources voltage for verification of devices such as data loggers, displays of process devices, and other controlling devices. A voltage calibrator is useful across various industry verticals as calibration is an important process to ensure the quality of any product. However, with the advancement in technology and R&D activities, users are shifting to other types of calibrators i.e. multifunctional calibrators. Multifunctional calibrators have the capability to measure not only voltage but also pressure, temperature, frequency, and current. Furthermore, they are designed for calibration of traditional as well as innovative test instruments. Additionally, multifunctional calibrators are employed in manufacturing plants, wherein multiple parameters i.e. resistance, current, and voltage are taken into consideration while producing a product. In terms of value, North America was the leading contributor to the global voltage calibrator market in 2017. The contribution is primarily due to the presence of well-established players across the region, especially across the U.S. and Canada. North America is home to many well-established players from the voltage calibrator domain including REED Instruments, Extech Instruments, Valhalla Scientific Inc., and Practical Instrument Electronics, Inc. Furthermore, North America is witnessing higher adoption of voltage calibrators due to continuously rising electronic manufacturing industry across the region. Many companies are taking efforts to capture a larger customer base for additional revenue generation. For instance, PCE Holding GmbH has conducted various marketing activities to capture a larger customer base for significant revenue generation and company development. Yokogawa Test & Measurement Corporation, Valhalla Scientific Inc., REED Instruments, Extech Instruments, and Time Electronics Ltd among others are some of the major players operating in the voltage calibrator market profiled in this study. Players are focusing on supporting distributors as well as end-users by providing them with extensive facilities. For instance, REED Instruments is continuously focusing on providing strong support to distributors and end-users for enhancing operational efficiency and revenue generation. The company has multiple locations for stock storage to support distributors. Moreover, the company also has multiple laboratories to provide calibration and repair services for various instruments to satisfy customers.